Are you looking to watch Netflix US from France? 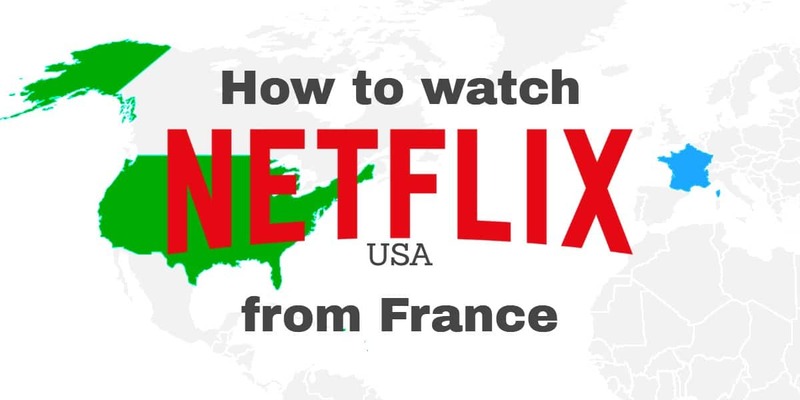 We'll show you how to unblock the American Netflix library from France and which VPNs are best for the job. Netflix subscribers in France pay more for a monthly Netflix subscription and get fewer TV shows and movies than their American counterparts. Although Netflix has expanded its French library over the past few years, it still falls short of the US version. If you want to access Netflix’s American library from France, you’ll need a VPN. Short for Virtual Private Network, a VPN encrypts your device’s internet connection and routes it through an intermediary server in a location of your choosing. In this case, you would connect to a VPN server in the US, which makes it seem as though you’re accessing Netflix from the USA. Netflix will, therefore, grant you access to the larger catalog of TV shows and movies. ExpressVPN: Our top pick. Unblocks US Netflix, works on many types of devices, offers 24/7 support, and utilizes strong security. NordVPN: Budget friendly option that unblocks US Netflix and has a zero-logs policy. CyberGhost: Easy-to-use VPN that has fast speeds and can unblock US Netflix from abroad. PrivateVPN: Fast VPN that has a simple interface and unblocks Netflix in several countries. Surfshark: Unblocks Netflix US with ease. Boasts good security and an unlimited number of simultaneous connections. Sign up for a VPN that can unblock Netflix. We recommend ExpressVPN. Run the app and select a server in the USA. Connect to the US server. Open Netflix and start streaming! Not every server from a particular provider will unblock Netflix. Typically a VPN provider operates a few Netflix-optimized servers, and these might not be apparent in the apps. You might need to contact customer support or consult your provider’s website in order to find out which server to connect to. All of the VPNs we recommend include live chat support that can walk you through what you need to do. Our top recommendation. ExpressVPN lets users access US Netflix from abroad by connecting to a handful of different locations. Once you’ve signed up and the VPN app is installed, just ask a 24/7 live chat support representative which servers work with Netflix. ExpressVPN is one of our top VPNs for speed, so you should have no problems streaming high-quality video from France. Netflix also unblocks other geo-blocked content including that from BBC iPlayer, Hulu, HBO, and Amazon Prime Video. The company operates more than 3,000 servers in 94 countries. Every connection is guarded by strong encryption, leak protection, and a network lock—ExpressVPN’s name for a kill switch that cuts off the internet in the event of a dropped VPN connection. The company doesn’t store any identifying logs. Apps are available for Windows, MacOS, iOS, Android, Linux, Amazon Fire TV, and certain wifi routers. You can connect any three devices at one time on a single plan. BEST FOR NETFLIX:ExpressVPN is our top pick. It’s a great all-around VPN that unblocks US Netflix from abroad. You can try it risk-free with a 30-day money-back guarantee. NordVPN is one of the most popular providers in the world, and there’s good reason for that. Almost every server unblocks Netflix. Even if you connect to a different country, NordVPN will usually redirect you to the US version of Netflix. Exceptions include Australia, Canada, Japan, the Netherlands, and the UK, for which NordVPN can unblock local versions. It also unblocks Hulu, Amazon Prime Video, and BBC iPlayer, among many other popular streaming sites. NordVPN is among the fastest VPNs we’ve tested, so you can stream HD video without buffering. You also get beefy security and data leak protection, plus a kill switch that halts internet traffic if the VPN connection drops. Apps are available for Windows, MacOS, iOS, Android, Amazon Fire TV, and Linux. BUDGET-FRIENDLY:NordVPN is a great value VPN that unblocks US Netflix and comes with a 30-day money-back guarantee. CyberGhost is the fastest VPN we’ve tested in 2019 and possibly the most secure as well. In addition to the traditional list of server locations, CyberGhost’s apps let you choose which streaming service you want to unblock. US Netflix is listed at the top along with several other streaming channels including Amazon Prime Video and BBC iPlayer. It will even open Netflix in a browser window for you, making it one of the most seamless Netflix-unblocking VPNs around. Encryption standards are strong and CyberGhost doesn’t store any logs about its users or what they do online. Apps are available for Windows, MacOS, iOS, and Android. You may connect up to seven devices at once on a standard plan. EASY UNBLOCKING:CyberGhost makes unblocking US Netflix a breeze, and it comes with a 45-day money-back guarantee. PrivateVPN excels at unblocking geo-restricted services like US Netflix and has fast servers to make streaming a breeze. Although its server network is smaller than the others on this list, PrivateVPN has a wide range of locations to choose from. The interface is simple and streaming servers are clearly labelled in the apps. PrivateVPN also unblocks Hulu and BBC iPlayer, among other services. Live chat support is available should you need it. PrivateVPN meets all of our security and privacy standards. Apps are available for Windows, MacOS, iOS, and Android. You can connect up to six devices at a time. SIMPLE AND EFFECTIVE:PrivateVPN gets the job done and unblocks US Netflix without hassle. Comes with a 30-day money-back guarantee. Surfshark allows you to connect an unlimited number of devices on a single account, making it a great option for a family or group of housemates. Almost every server unblocks Netflix US; even connecting to servers in other countries will redirect you to US Netflix. That means there’s no anxiety about choosing the correct server to stream from. Surfshark offers quality speed, security, and customer support. It keeps zero logs and also unblocks BBC iPlayer. START UNBLOCKING:Surfshark lets you unblock Netflix on as many devices as you want and comes with a 30-day money-back guarantee. Can I use a free VPN to unblock US Netflix from France? Free VPNs are not recommended for Netflix. Attempting to watch Netflix while connected to a free VPN will result in a proxy error in all but a few rare cases. Even if you happen to find a free VPN that Netflix hasn’t blacklisted, most free VPNs are too slow to stream video. Free VPNs also tend to be less secure. To make money, they often harvest user data and sell it to third-party advertisers and data brokers. Some free VPNs even carry malware. Paid VPNs have the resources and business incentive to keep Netflix-unblocking servers maintained and available at all times for customers. We recommend you stick to paid VPNs and stay away from free alternatives. Despite the smaller library, the most basic Netflix subscription costs US$9.01 per month in France. In the US, a subscription costs $7.99 per month. 8 Can I use a free VPN to unblock US Netflix from France?